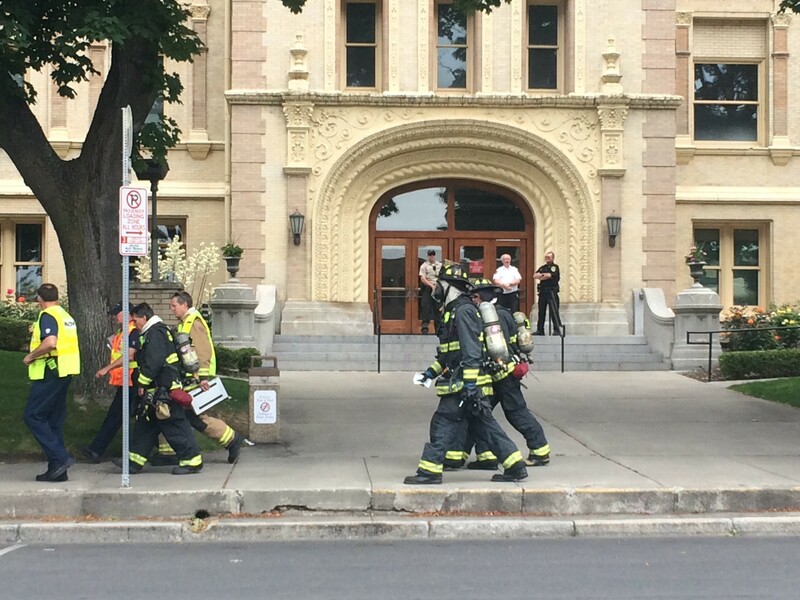 The Spokane County Courthouse was evacuated this morning after employees opened a package sent to the courthouse and started to feel sick. Approximately six employees complained of sore throats, headaches and chest pains, according to the Spokane Fire Department Assistant Chief Brian Schaeffer. Those symptoms dissipated once the employees left the building, Schaeffer said, but they went to the hospital just in case. At this point, it is still unknown what kind of hazardous material was contained in the package, though Schaeffer said the tool used to detect noxious chemicals in the air did not detect any life-threatening substances. Schaeffer did not know if the package was addressed to anyone employee specifically, or how many packages were sent. "I can tell you right now the building is safe and there were no detectable weapons of mass destruction in the atmosphere or another type of irritant like mace," Shaeffer said. "We didn't find any trace of that." FBI and US Postal Inspectors have taken over the investigation, Sheriff's Office spokesman Deputy Mark Gregory says. Officials could not say if/when the courthouse would be reopened today.